Carte Generale de la Grece. 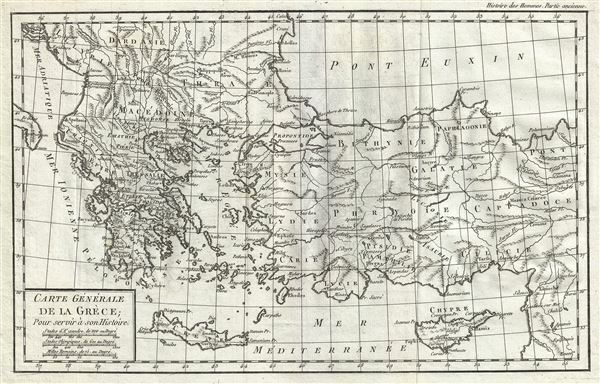 This is a lovely 1782 map of Greece, Turkey and the Balkans by Jean- Baptiste-Claude Delisle de Sales. The map covers from the Adriatic Sea and the boot of Italy eastward to cover the Black Sea, Cappadocia, Cyprus and Syria. It extends southwards as far as Crete. It includes the modern day countries of Greece, Turkey, Macedonia, Albania, Cyprus, Montenegro and Bulgaria. The map identifies several important cities and towns, rivers, islands and other topographic features, with mountains rendered in profile. When this map was drawn this region was dominated by the waning Ottoman hegemony. The Ottomans would nevertheless continue to exert a powerful influence on this region until the early 19th century.